With reverence for Tibetan wisdom practiced since the distant past, a deep concern for present conditions burdening humanity and astonishing prophecies, the Agartha—Inner Earth Symposium held in Garden City, Long Island was a remarkable learning experience. Hosted by organizer Sandra Sabatini of Louisville, Kentucky during late August, 2017, additional support for the presentations came with related material contributed by New York author and publisher Peter Moon. A Skype visit by time modification scientist Dr. David Anderson spoke on that topic, while Montauk Project experiencer Duncan Cameron bought people up to date. After the flight from Bucarest to JFK, Ms. Maassen and her family companion Teodor were asked if Europeans were more aware than Americans on the topic of extraterrestrial visitation and the interstellar conflict now being waged nearby and on Earth They re-sponded agreeably right away: Americans have a ways to go before the truth makes impact in the United States. In Romania, as an ambassador of Agartha, Tamarinda maintains that position with teaching work devoted to presenting Tibetan spirituality based on emphasizing the true nature of reality. She’s a straight shooter about it, one who conducts the lectures with a pleasant, animated style, with even the most difficult scientific passages capably translated from Romanian to English by her assistant Teodor Maassen. 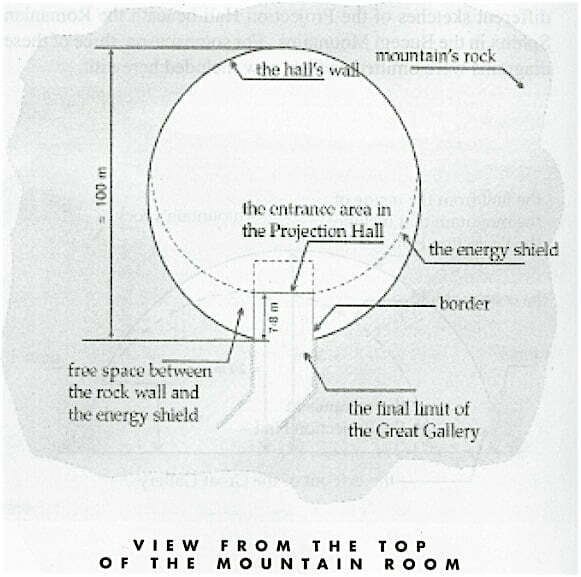 The fundamentals of spiritual traditions practiced in Tibet are often convincingly supported with diagrams, while they occasionally provide indications about what life is like in Agartha—the ancient, storied land that a growing number of recent investigations indicate does indeed exist as an active, major population located in a still secret subterranean setting…yet perhaps not much longer. 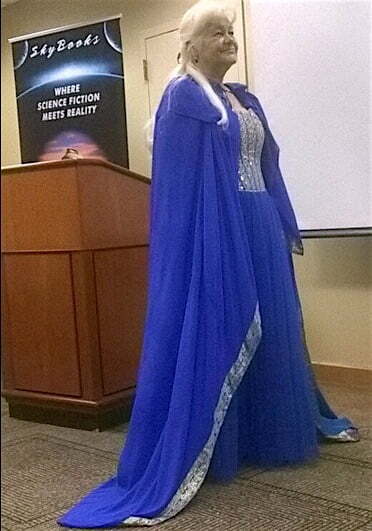 Elegantly dressed, Tamarinda’s presentation began with making a special welcome to each guest. Standing nearby each seated attendee, she looked intently into their eyes and created a conspicuous telepathic connection. One person recalled his experience by saying that it was “…as if she was looking deep into my being.” When he replied to her by thought that he had come all the way to New York to help, Tamarinda gently nodded back. In this captivating way, she visited each member of what was a smart, well-informed and inspired audience of 150 who had come to Long Island from all reaches of Earth. The Symposium topics highlighted here include only a few of the many startling statements made and just three of the dozens of diagrams sketched. Some truly eye-opening slides were shown, yet, for discrete reasons, none are pictured here. Some who are hearing Tibetan influenced concepts for the first time may experience some teachings as a shock. Some of them are intended to challenge and stretch, or certainly reverse, the often limited, rationally controlled methods of Western thinking. She also noted the existence of another place in Agartha named Solomonari, the place in Inner Earth that King Solomon was named after. In Romania, the term Solomonari is also applied to a class of beggars or shepherds, both of whom are held in respect. “All planets have hollow spaces,” she instructed, “unless they were created for other purposes.” Indeed, the geological conditions that allowed for making many hallowed out areas under Earth are explainable and examples of these are found in the great caves found all over our planet. As the planet’s molten upper surface mantle heaved up into mountainous regions, large recesses formed underneath as the materials cooled off and molded into huge, ‘honeycomb’ like caverns. This description only sums up a much more complex geological process. During speaker Duncan Cameron’s storytelling session later in the conference, he noted that the Mammoth Caves in Kentucky were once an entryway to Agartha. This subterranean complex has been calculated to be 348 miles long. [Duncan’s background includes being a very young participant in the illegal time travel experiments of the Montauk Project. Other technicians who say they worked on this ill-fated operation have also claimed that these strange experiments took place at the former Montauk military installation located on the easternmost edge of Long Island, New York.] In the deep past, prophets who were aware of these underground sanctuaries and who were, at the same time, deeply respected among those they lived with would forewarn of a coming disaster, be it a natural coming crisis or some conflict involving a war or such. Enough inhabitants believed these predictions and left their homelands on the surface of Earth before tragedy stuck. The prophets saved their lives—often, along the life of the prophet. They had been told where to take refuge beneath the planet to gain natural protection. There are many legends of other civilizations that were ravaged by natural disaster or came under fierce military attacks. A good number of these survivors fled underground, too. Research of ancient texts from many past global cultures does indicate that some of those who escaped—groups relatively small in number, took records with them—including a knowledge of high technology. When we look at the many confirmed areas beneath Earth that are hallowed out, it is conceivable that some were taken over by survivors of these tragedies and were redeveloped with use of the advanced technologies they brought with them. 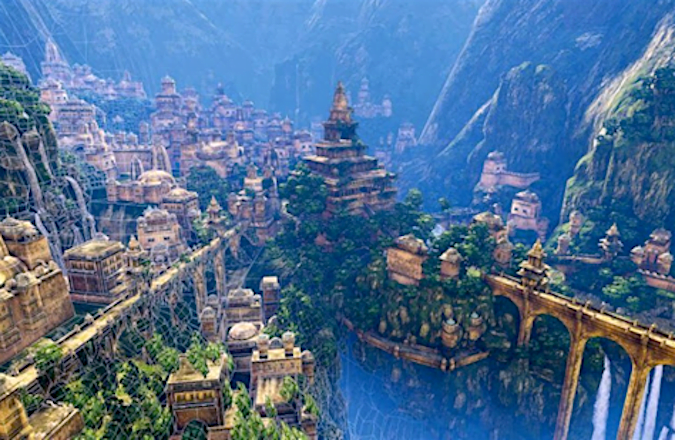 Agartha may be an example of such a civilization that existed in the distant past where castaway inhabitants made the best of conditions of survival by ‘ascending’ into a highly advanced population guided by their own spiritual capabilities. Since then, we can easily speculate that Inner Earth civilizations watched as newly renewed editions of humanity thrived once again on the surface, only to meet with crisis again, even as subterranean cultures remained untouched by the destructive events, protected—totally unaffected. Analysis of what Ms. Maassen indicated would be to say that the Agarthan community is taking a much stronger, more proactive stance in dealing with the “surface tensions” in the world above them today. Out of this concern for the consequences of the major, life-threatening conditions erupting among humans on the surface, they may be preparing to diplomatically intervene. Tamarinda is the voice for members of the Agarthan community who are firmly announcing that they would welcome interaction with the surface population to help bring about the material and spiritual changes needed to save the world from yet another extinction event. Taking a moment to review the background for this, the 3D [3rd dimensional] reality most of us live in is the most dense condition. At the same time, many spiritual teachers say, it’s a grand illusion. As individual and group consciousness increases into the more spiritual realms, beings ascend to a 4th dimensional existence, 4D, shedding some of the attachments to material life and welcoming knowledge that they are on a path back to our common source. In 5th dimensional existence, life takes on an even greater ethereal perspective. Agartha, Ms. Maassen testifies, became a 5th dimension [5D] culture long ago. According to reports by credible whistleblowers which began in late 2015, more than a half-dozen Inner Earth cultures formally met, each attendee a representative for their race and they discussed the help required to tame the problems of the surface population. It is possible that Agartha, with a larger population, has taken the greatest interest in establishing relations with surface humanity as an agenda that benefits populations below Earth as well as those on the surface when it comes to the urgent need to liberate Earth from what is now recognized as a predatory form of tyranny? She stirred the spirit adventure when she reminded everyone about the classic science fiction story Journey To The Center Of The Earth, Jules Verne’s iconic tale of a scientific visit to a world that time forgot. Yet, despite the innermost destination of Verne’s famous adventure, Earth’s core is not likely where lost worlds exist, but there is other evidence that they are located within a few miles of Earth’s surface. 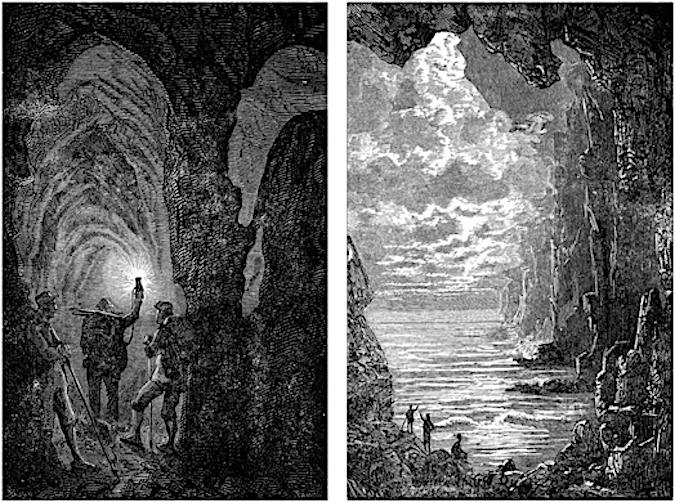 Original illustrations for Journey To The Center Of The Earth by Edouard Riou. Some of these enclaves are said to be accessed from fissures in easily accessed rock formations, caves and through an abundance tunnels found everywhere under the planet as both ground probing satellite and surface level investigations have discovered them. In 2017, for instance, Mexican geological officials announced that their studies plotted 700 miles of tunnels offering transit between Mayan communities. “Inner Earth bases are connected by tunnels,” Ms. Maassen said. There is much evidence on record to corroborate the existence of active underworld societies that maintain great discretion and meet all of their needs by with what today would be considered ultra high technology left from times when these peoples were connected to such past advanced civilizations as Egypt, Tibet, Atlantis or, long before, the culture known as Lemuria that incubated early here on Earth. One Inner Earth group claims to have evolved here millions of years ago. Conventional archeologists continue to act outraged when the slightest mention is made about strong evidence that an ‘Atlantis’, ‘Lemuria’ or any other small, but quite obviously advanced civilization existed ‘before the Great Flood’. This huge fight continues to keep such valid evidence hidden from common knowledge among all people in our world. Tamarinda stated that the total area of usable land found under Earth is “larger that the available land on the surface.” However, unlike the fictional entertainment of Verne’s book, along with the other Inner Earth stories that contend there are civilized settings with large tracts of land found deep in subterranean vaults, real evidence indicates that the advanced civilizations we’ve been discussing are actually located at much more shallow depths, in vast cavernous areas long ago converted to living quarters. In Jules Verne’s work, the other correct knowledge about an Inner Earth he included in the story leads us to wonder who informed him, even though his voyagers only witnessed the remains of a civilization past and no living humans and that his central concept of placing these remains at Earth’s center is likely either a misconception or planned disinformation. Not long after the success of Verne’s book was published in 1864, an American-born aristocrat with a German lineage named Baron Edward Bulwer Lytton published a German language book in 1871 with the title The Coming Race as a document of his astonishing visit to a vast, highly sophisticated ‘kingdom’ existing beneath us. As the book opens, Lytton descends into a mine at the invitation of a friend who is a mining company engineer who wants him to see what has been found down in a mining pit. As the two of them descend down on foot, the miner slips and falls into the depths to his death. After making his way to the bottom of the shaft, Lytton sees a dim light. He follows the barely lit passageway to the outskirts of an amazing kingdom populated by a human-looking race. Youngsters takes him in and give him a place to stay as they introduce him to the worship of a sacred energy source that they call the Vril, the secret force of the universe which they believe pervades all organic and inorganic material as a basic, life-giving energy. Lytton spends some time learning about these highly educated people who inhabit cities with populations of no more than 17,000 people, with many cities linked to make up a much larger underworld nation where Lytton witnesses personal flight taking place as aided by winged devices. When first published, Germans preferred to treat Lytton’s book as great science fiction, yet, fifty years later, during pre-Nazi rise of German interest in all things spiritual, many came around to believing that Lytton’s account was true after all. Ms. Maassen also brought up the alleged experience of American Admiral Richard Byrd, the first man to fly over both of Earth’s polar regions, and an encounter with a Germanic civilization which is described in the ‘lost dairy’ Byrd was said to have written before his death. In the account, while Byrd flew near the North Pole, to his great surprise, he sighted lush green land beneath him. He was then contacted by entities who invited him to land his plane. In the meeting that followed with representatives of the human society greeting him, they told him to return to his superiors and demand that nuclear weapons be outlawed. In all fairness to accuracy here, however, a recent analysis concerned with the legitimacy of Byrd’s dairy revealed that the publisher of the ‘found Byrd dairy’ was actually related by family to the Bank Of America fortunes, finances associated with the Black Nobility of Italy. On the other hand, it’s a fact that Byrd was noticeably affected to profess a positive change in his personal consciousness towards the end of his life. Even so, he never spoke out publically about what brought that dramatic change in his life about. As a good military man, after being told to remain silent, he never let on much about what he’d discovered during extraordinary years of duty as a very high ranking member of the U.S. Navy. Further verification for tales of populations living under Earth were collected by Project Red.com which features well over 100 stories—most of them from public sources like old news articles—about possible Inner Earth encounters, with each case recorded and alphabetically filed on 37 pages of potential significance to supporting the idea that our planet may harbor many hidden populations, some of which are not inhabited by anything remotely human. The best companion reading to every subject raised in the Symposium is found in a series of 5 English language books by Romanian author Radu Cinimar which are available from Sky Books.com, all of them edited by author/publisher Peter Moon. In the opening introduction to the third book, Transylvania Moonrise. [2011 Sky Books], an intriguing list of Romanian based evidence about the existence of Agartha is presented about a range of other Romanian anomalies which strongly indicate the existence of an Inner Earth enclave. “Creation is unexplainable,” Tamarinda suggested after the eternally debated subject of creation comes up. Despite her statement about something most people consider incomprehensible, she did her best to explain it by first drawing a diagram to help visualize an answer to the big question about our original Source. She placed a single dot and designated it as representing a super consciousness. 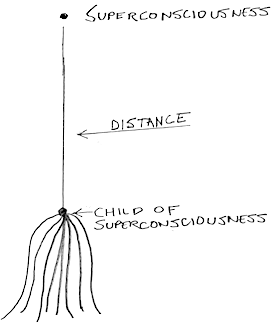 A line was drawn straight down, through a distance in space and time, to another dot which represents the consciousness of a child of the super consciousness. Other lines sketched in trail down and outward to represent future offspring. Thus, the ‘superconsciousness’ exerts a divine force that drops down through distance, through multidimensional densities, to support birth of new spirits. Just as the soul is linked to the heart, she brings up the fact that our highly individualized DNA data is imprinted behind our eyes by a process that is holographic in nature. Ultimately, we have 24 pairs of genes, but only use 22 of them. P40 is the term applied to the higher pairs of genes and is the defense mechanism of the body. The lower genes are called the P24 genes. The concept that the mind operates within a larger field of consciousness is of great importance to understanding exactly how we function. These introductions to our fundamental knowledge of human operations—facts supporting the physics in play—often lead to surprising explanations about how quantum mechanics rules our universe. Each Chakra generates a field, so we have 7 fields separated by about 50 centimeters each. 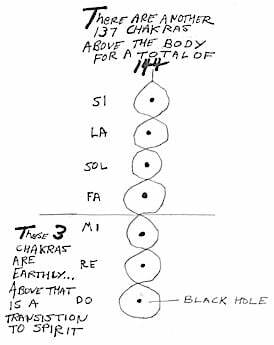 1st When you are born, the first Chakra anchors into the ground, establishes stability, our ego and the battery on which we live. 2nd Sexuality. Learn to conserve energy and not deviate to it. Adolescence. 3rd Light. Eye of God science rules until 28-30 years when you want power to be a leader. 4th Love—either exists or not. A time to have children. 5th Destiny, truth and the ability to carry these concepts to an end. 6th We are the light itself. Love, compassion. Guidance from the Christ, reflection and clairvoyance. From here, we can stay and become a teacher—or go home.We all have the potential to become the Christ energy and nust learn how to become enlightened. We are surrounded by God. 7th Lotus chakra—Celestial knowledge, home and back to the Source. 8th Infinity From here, you can go into another dimension. We each have a total of 144 Chakra levels. ‘First, work with yourself, what you say and think,’ Ms. Maassen advises. The challenge is for people to understand that consciousness affects reality. She asks them to assume the primary role in causing the reality they want. “Get rid of your attachments, get rid of people and events that keep you attached.” For those who become saddened with the idea of this separation, she said “You have to love them [family and friends] enough to let them live their own lives.” At this stage, she elaborated, “You will be the receiver [of the action],” she tells her listeners. “‘What you give, you must pay the action in some way. Don’t take things for free,” she continues, “you must have exchanges, [an] energetic exchange—if you take it for your own actions.” She issued a warning: “If you decide to think the same as others believe, you will share the results. Use your mind to find your purpose—that’s true genius!” Lastly…“If you take on authenticity, you start to get rid of misunderstandings,” she instructed the gathering. 7 years of training in mind, body and spirit are required to become an initiated Tibetan monk. As for the monk’s practice of chanting mantras, specific mantras are regarded for their ‘enchanting power’. Mantras are vibrations with words. Monks repeat certain mantras 108 times as a sacred technique at the Tovah Mongolian monastery where it is said that 108 books made of gold reside. 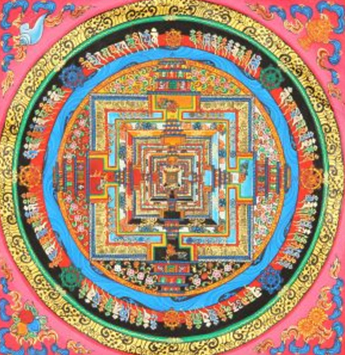 Each book is connected to a lama. “There is potential in everyone for a 2nd birth in life, a rebirth, the true awakening,” Tamarinda said with encouragement. A first field rotates in one direction and then, at another level outward, another field begins to rotate in the opposite direction after you awaken. After this 2nd energy field starts, meditation allows a person to rotate the whole thing in the opposite direction. 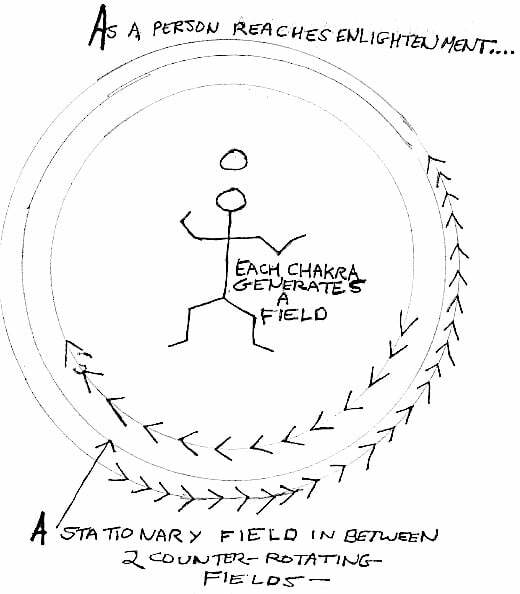 As the 2nd field rotates in the opposite direction, anti-gravity is created. As a Tibetan student begins to experience being “enlightened”, they can learn to control these rotations at will, a spiritual accomplishment which can lead to mastering feats of levitation. “We are more than what we see [and] live in an illusion,” she went on to say. “This reality was created a long time ago. Someone before us created that reality and each of us experiences that reality.”…a reality formed by prior ‘agreements’. Early in life, Tamarinda Maassen became deeply involved in studies of the physical sciences. She rose to become recognized as a prodigy in possession of unique understanding of physics in times when the much more accurate science of quantum physics was emerging. In the 1920s, Tamarinda was picked to work with and consult Herrman Oberth, one of the founding fathers of rocketry and astronautics, who based the foundations of his work on a book written about rockets in the 1500s. 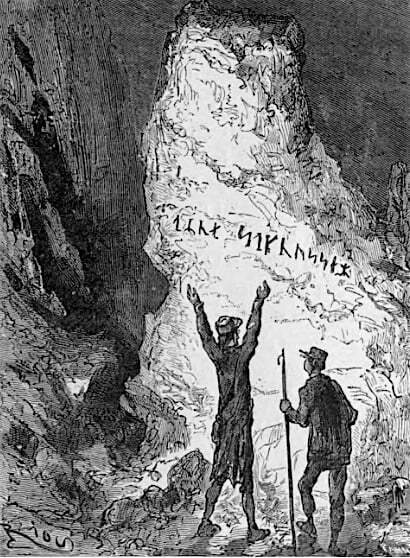 Both Ms. Maassen and Oberth came from the Transylvanian region of Romania, lands inescapably tied to wicked tales of Dracula, yet, in actuality, it has been the background for many other uplifting legends, such as the belief that Norse god Odin was born there. Transylvania, Hindu tales claim, was also the setting for visits by the influential, benevolent god Rama and his entourage. 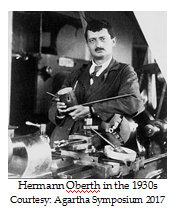 In Romania, Oberth refined rocket science to a point where, even though he was an outsider to the Nazism overtaking Germany, he became Werner von Braun’s teacher in Germany. After the war, when chief Apollo engineer von Braun had vibration problems on the Saturn C4 rocket intended to hurl men to the Moon, NASA hired Oberth away from his university teaching in Hungary. Oberth helped von Braun stabilize the main, first stage booster of the Saturn rocket to become a major figure in the Apollo Moon program. Two influences arising from the same non-human culture influenced the Nazis in separate development deals made with the Nazis as early as the 1920s. The key group in question is described by Ms. Maassen when she refers to these ‘people’ as “…parasites [who] came here to feed off of the gods. They like an acid environment…They live off of the chain reactions in our bodies.” In Romania [as well as within many other older cultures], they were consistently referred to as horrid ‘Demons’. Today, this reptilian breed is more formally known as the Draco, which refers to the star constellation where they are said to have been artificially cultured in genetic manipulations performed by deranged humans to create cunning warrior beasts. “They gave Hitler television so that he could create tyrants at home after first broadcasts in 1935,” Ms. Maassen recalled. “Nazis were connected to the [Tibetan] lamas, who gave them [the] cosmology,” Tamarinda disclosed. “These lamas revealed the dark side of Tibet while the Third Reich was looking for Inner Earth.” Some lamas were known to have been threatened by Nazi ‘raiders’. 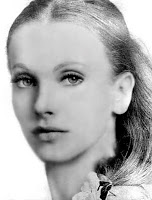 Tamarinda explained that the lamas gave the technological plans to them so that Hitler “would not get them from another source.” Like Oberth, she echoed the same belief, that “…Hitler had his own connection to ETs.” She was likely referring to other, competing Third Reich anti-gravity development known to be technically supported directly by Draco activity. These cooperative interactions remained carefully hidden within the heavily compartmentalized Luftwaffe aviation wing of the Third Reich, as managed by Hitler’s chief engineer, Hans Kammler. Mere mortals can’t get into Agartha—much less spiritually dead Nazis—yet, according to Ms. Maassen, they did find or force their way into “the first level of Agartha”…somewhere. The copy of Orsitch’s basic drawing pictures the simplest demonstration of one form of anti-gravity concept, one which features three discs. The center disk remains stationary while the two on either side are spun in counter-rotating directions. Thus, when a specific spin speed is reached, a lifting effect occurs to oppose gravity in a certain range, the basis for ‘anti-gravity’. [A number of other methods of achieving ‘anti-gravity’ and ‘faster than the speed of light’ spacecraft exist and have been extensively developed.] Crawford notes that the resulting mechanism made the conditions for flight possible by creating “…an extremely strong field around itself extending somewhat into its surroundings which would render the space thus enclosed including the machine a microcosm absolutely independent of the Earthbound space. The fields created by Orsitch’s three mechanical disks do compare directly to the two counter-rotating spiritual auric fields that occur in humans who have long practiced producing this phenomena for awhile as a measure of reaching enlightenment. With the unmoving, stationary field the effect can be experienced is human levitation. When compared to the Virl women’s disc experimentation, the two counter-rotating plates separated by an unmoving one produce ‘anti-gravity disc levitation’. Tamarinda also provided another example of how the reptilians aided the Nazis in coming up with working models of their prototype ‘flying discs’. “When the Draco taught Nazis how to make their first anti-gravity machines for flight,” she explained, “they used alchemy.” Alchemy is considered the most secret of sciences, a field in which those who become adept at practicing it learn how to convert various atomic structures into other atomic alloys or forms to achieve what’s needed to achieve a technical goal. 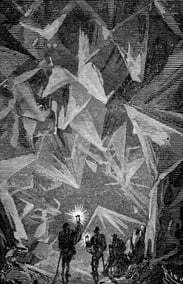 Pictured above are a few of the very early designs that the Vril Society developed and flew. It is greatly important to note that, in a book published in 1915, highly placed U.S. Navy Intelligence officer William Tompkins, the gifted designer who also acted as a chief manager of the Apollo Moon program, confirmed that reptilian military forces, known as the Draco or Saurians, directly aided the enormous flight engineering advances made by the Third Reich before and during WWII. Tamarinda provided a short review of the importance of symbols historically known as ‘Runes’. Based on simple symbols, runes are a language that was used in secret Germanic societies. “These symbols have power and can control,” she revealed. “Powerful people will use mystic symbols to gain prosperity. Runes can be activated in certain rituals… Once activated, they have power…When you have that power, no one can rule you.” Runes were also known to have had popular use among Nordic tribes and shamans who learned how to employ them for various rituals. “The workings of time are important,” he said, “We have the capacity to move time. It is fluid…Time control holds the potential to change our lives and reality in ways that are difficult to comprehend.” Is there a positive influence here on Earth from a place “beyond time”? 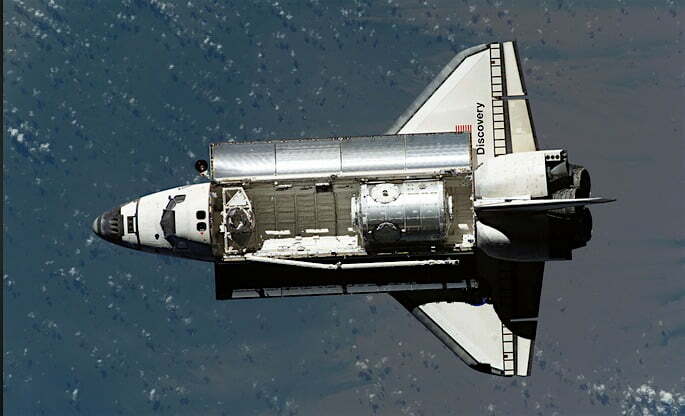 The Space Shuttle was used on multiple missions to deploy intelligence gathering equipment and possibly weapons into space for the Department of Defense. One of these was devoted to geological surveillance, a satellite electronically capable of probing deep within the ground [If you please, visualize a highly advanced form of X-ray vision] to detect resources, military operations or structures. This Pentagon operation detected a suspiciously shaped facility hidden inside one of the Bucegi Mountains in Romania, under a mountain topped off with a sculpted stone figure with facial features that’s long been called ‘The Sphinx’. Tumultuous events soon followed, circumstances summed up best by Peter Moon as ‘intrigue, turmoil and restriction’. What follows below are passages extracted from introductions to several of the 5 book series Peter Moon has published about these events, originally chronicled by Radu Cinamar, the Romanian writer whose life was spiritually transformed greatly during the experiences that he details with considerable writing skill in each book. The American military unit used exotic Earth boring machinery equipped to dig with plasma and magnetic resonance technologies. In operation, these mobile units can create up to seven miles of a large-size, smooth-wall tunnel a day. 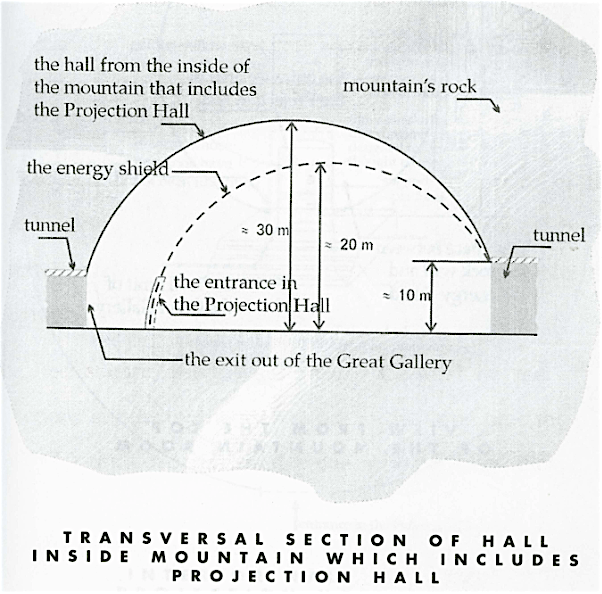 Highly sophisticated technology was found in what became called the ‘Great Chamber’, a circular room embedded in solid rock, the construction of which must have required exotic techniques, measures around 300 feet in diameter and is covered by a dome more than 90 feet high. The first machine described was activated by one of the main characters in the overall story, Cezar Brad, a Romanian intuitive who had been trained since very young by a Tibetan lama to become a master of the higher levels of consciousness. In his twenties, Brad was appointed to head Department Zero, the Romanian government office put in charge of investigating all odd phenomena. Department Zero could be compared to an X-Files operation run, not by FBI agents, but by gifted psychics. Once the first device was turned on, a person could place their hand over the machine and the holographs produced would display medical data about their condition right down to DNA details. The second device demonstrated would clearly show detailed highlights of historical events as holograms of those episodes—but only up to around 500 AD. 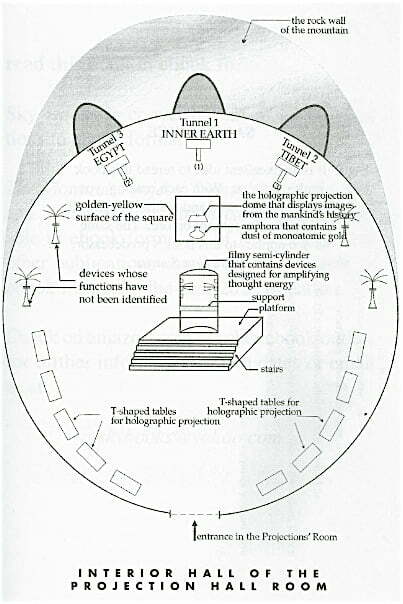 Another machine energized in the Bucegi complex pictured holograms of different species of advanced extraterrestrial life forms which could then separately bring up another extraterrestrial life form, then combine them as holographs which showed how the two might look when genetically joined. An upright platform exists in the center the chamber, its purposes unknown, which indicated that those who walked into it must have been 12-14 feet tall. If this is an indication of the common height found in the culture that built the complex found inside the Bucegi mountain, they were twice the size of humans today. With further secrets involving this technology hanging in the balance, guarded full-time by NATO troops to prevent full disclosure, the world will have to wait for the Great Chamber to be opened to inspection by the modern world. In the years since, brave Romanian newspapers have published detailed reports on the discoveries and the international suppression of those events, so the public in that nation is fairly well aware of what’s been going on. “The end of ruling will come,” she assured the gathering. That hardly meant the end of the world is coming. She argued that the limitation of knowledge imposed by the global elite is unlikely to keep humanity arrested in tyranny much longer. In 1990, archeologists discovered indications of a prior civilization centered in Romania. These finds may be no surprise to many Romanians who are aware that their nation holds a huge potential impact on the making of a positive future for humanity. “There are 7000 kilometers of tunnels under Romania…[many of which are] lined with solid gold” Indeed, Transylvania has one of the biggest deposits of gold in the world. All told now, Romania could become a major world player as selfish controlling interests dominating the world now continue to lose power as humanity begins to mature after a centuries-long delay in natural spiritual evolution. Rob Wold is a former film and television writer/producer and director whose documentary work has appeared on PBS in America. He was a director of photography on 2 dramatic foreign language feature films, written several acclaimed screenplays, worked in film casting and performed successful development of major film financing. Rob can be reached at woldrob@yahoo.com. Thanks to Linda Castile of Belize for taking detailed notes and allowing their use in composing this essay. Thanks also goes out to Lauren Williams in New Orleans for help in preparing some of the graphic art contained above. Zvi Har’El’s Jules Verne Collection jv.gilead.org.ilOriginal illustrations for Jule’s Verne’s Journey To The Center Of The Earth all by Edouard Riou. Research provided by Mary Jo Collins in Chattanooga, Tennessee. Article by Arjun Walia: The Legend of Shambala, January 31st, 2017. Source—Collective Evolution. This entry was posted in Uncategorized and tagged Agartha, Bucegi Mountain complex, deep state, Earth, extraterrestrials, hidden, history, inner earth, Inner Earth Symposium, Knights of Agartha, love, prophecy, Rob Wold, Romania, spirituality, Tamarinda, technology, Terra, Tibetan lamas. Bookmark the permalink.